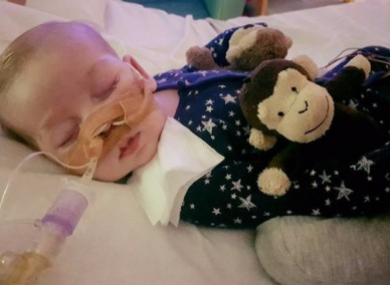 THE EUROPEAN COURT of Human Rights has ordered the British government to keep providing a baby with a rare genetic disease with “appropriate” treatment after a London High Court ruled that he should be allowed to die with dignity. However, doctors have concluded that it could cause prolonged suffering. The ECHR said Charlie’s parents had filed a request for an urgent interim measure to stay the London ruling to allow the European Court to examine the request which it said had received “detailed consideration”. A court statement added that “in the interests of the parties and the proper conduct of the proceedings before it,” it was asking the British government to prolong the application of the interim measure until 19 June, extending its initial demand to continue treatment through to 9 June. Interim ECHR measures are urgent exceptional measures granted only in cases where there is an imminent risk of irreparable harm. They are also binding on the British government rather than the hospital treating Charlie. Email “European rights court urges UK to keep treating baby with rare condition”. Feedback on “European rights court urges UK to keep treating baby with rare condition”.